It’s that time of year again. Approximately 45% of the American population is setting goals to get in shape, become financially fit, or to spend more time with their family. Yes, we’re talking about New Year’s resolutions. Because it is an annual American tradition, we thought it would be helpful to examine a few statistics as well as provide some tips for how to stick with your resolutions. 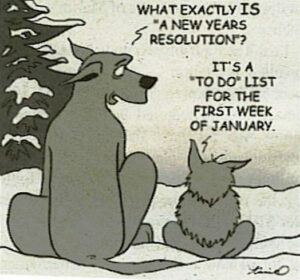 Don’t make a resolution just because you think you should. If you don’t really want to lose weight, don’t decide that’s your resolution. 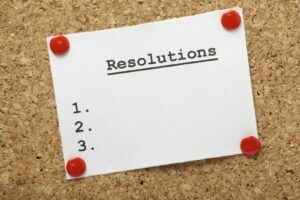 If your resolution doesn’t fit with your values and goals, you will not succeed. One of the most important aspects of goal setting, is to make goals measurable. Don’t just say “I want to save more money,” or “I want to work out more.” Change those resolutions into “I will save an additional $100 per month.” and “I will work out for at least 30 minutes, 4 times a week.” This allows you to measure your success. If your goal is significant (like losing 30 pounds) making a plan will help you to break the goal into smaller steps. This will make it feel less daunting and will motivate you along the way. Making a plan can also help you to build in motivational check-points and make sure you don’t drop the resolution in a a few weeks. If you find that you’ve fallen off the resolution wagon, don’t be too hard on yourself. There are a number of reasons why slip ups occur. The important thing is that you recognize it and recommit. Positive change isn’t just for January.